Stand up paddle board racing - On your mark! Stand up paddle board racing has grown exponentially in a relatively short time. According to Wikipedia’s entry on stand up paddle surfing, the first stand up paddle race took place on August 8, 2007 on the North Shore of Lake Tahoe in Tahoe City, CA, with 34 competitors. By 2012 the numbers had grown: 400 competitors from around the world AND 4000 spectators. 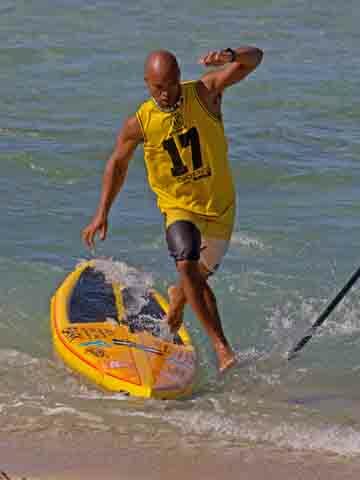 The event is called the Ta-Hoe Nalu Paddle Festival - link - http://www.tahoenalu.com/. Like other SUP disciplines, racing is attracting converts as fast as you can say “Go!” The reasons are the same: it’s easy to start, anyone can try it, and it’s fun. 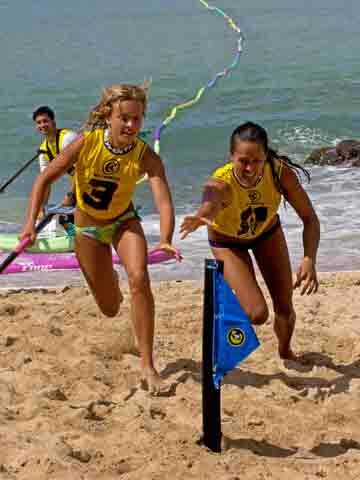 It can also be lucrative: in 2013, $25,000 in cash and prizes was awarded to competitors at the most prestigious professional stand up paddle board race in the world: the “Battle of the Paddle” - www.battleofthepaddle.com, held annually at Doheny State Beach, California, U.S.A. There, race events are offered for a wide range of enthusiasts, including the open age group race, elite race, distance race, team relay race and the kids race. In 2012 the Battle of the Paddle set the world record for the largest SUP race, with 404 paddlers. Follow this link for a list of racing events around the world. A growing phenomenon? You bet. One day, this could even be an Olympic event! Currently there are three racing classes for SUP racing: Fun, Serious Fun, and Very Serious Fun. At this point in time there is still a "pick the board you want" scenario. In other words, there isn't a regulation single board designed to equalize contestants, although as competition becomes more serious and stakes become higher, regulations will be a given. 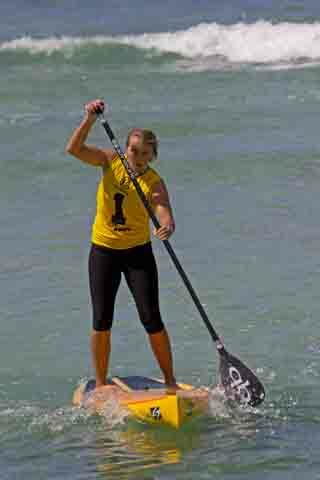 See more on SUP racing classes/divisions below. How and why to might want to race is explained in the following video. 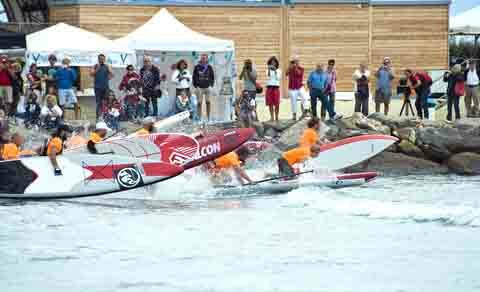 The SUPAA and manufacturers announce race board restrictions March of 2014. Rules will come into effect 2015. This is the least competitive class of SUP racing, where entries come with their personal boards whether they are narrow or wide, wave, touring or all-round stand up paddle boards. Length is the primary regulation here. Note that one brand of 12.6 board compared to another brand of 12.6 board may not be equal in speed. This class is a perfect starting place for those who just want to experience what sup racing is all about. This class is serious. The boards are specifically built for SUP racing, with a small amount of rocker and pointed nose, but the tail and hull shape can vary. They are shaped at the nose like a kayak to cut through water with minimal drag. This class of paddle board racing may have regulations regarding the existence of a rudder. This discipline of paddle board racing is where you'll find innovative racing board design—perhaps the most innovative design for stand up paddle boards, period. These boards don’t really don't look like other SUPs; they are more comparable in appearance to a kayak, and can travel at great speeds. The nose is always pointed, although the tail may still vary in shape. If the board has a rudder, it is controlled by the forward foot—and yes, this takes some practice! This board is the most expensive, and this category is for the very serious. Race Directors have the option to omit any of the categories depending on number of entrants, conditions, length of race, etc. These are recommended guidelines from the World Paddle Association (WPA) and are categories that WPA will both sanction and rank against. 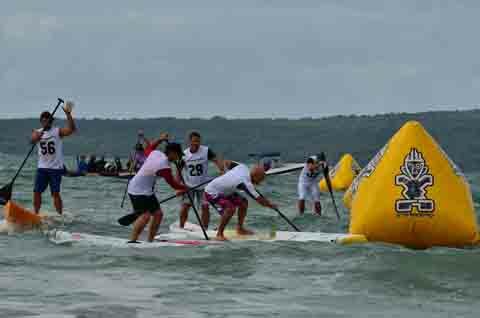 Looking For Paddle Board Race Schedules? Follow this link. A growing phenomenon? You bet. One day, this could even be an Olympic event!